‘Hate to Say I Told You So’ was one of the most iconic songs in early 2000s, performed by the band called The Hives. Now the phrase also reflects my views on the evolution of Turkey’s price stability indicators this year. In line with my (ahead of the curve) expectations, which I shared in a blog post in May (Why Inflation May Not Fell to Single-Digit Figures This Year), the year finished with a double-digit inflation figure in Turkey as the new year also brought no good news. The prospect of market consensus is now for an inflation rate remaining above 10% until the last quarter as Turkey will hopefully reach a single-digit inflation rate as of Q4 2018. 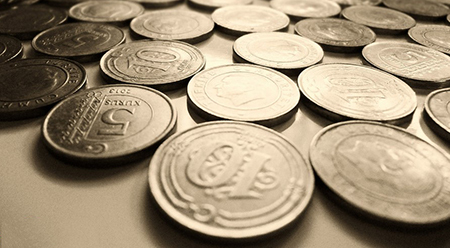 In our view, in case Turkish lira does not face a severe depreciation against major currencies, the improvement in inflation should be faster than market expected, though we remain pessimistic on the outlook of price stability in Turkey mostly due to the central bank’s reluctance of (needed) monetary tightening. From a statistical point of view, all price indicators currently stand at unprecedently high levels based on their historical averages, which should be supportive for an optimistic case. On the other hand, Turkish lira’s long-standing vulnerability to external shocks prevents us from attaching credence to this scenario amid the fears around a pick-up in global inflation. 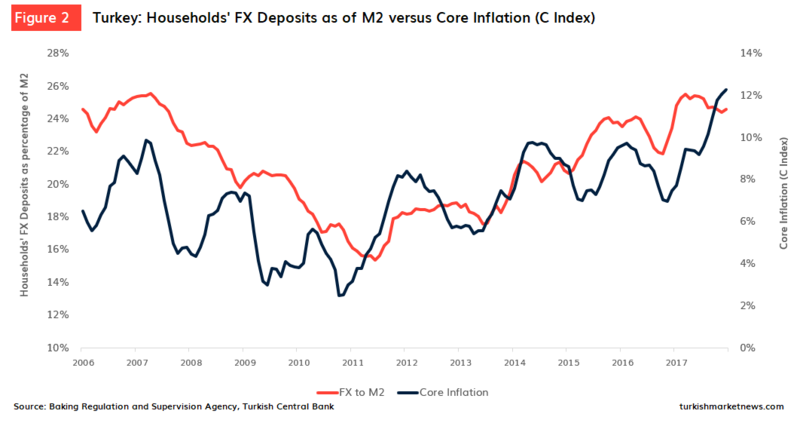 On a separate note, our long-term caution for rising inflationary pressure in Turkey stems from the relevant dollarization process in the economy as evidenced by individuals’ strengthening demand for deposit account in foreign exchange. The chart above shows the relationship of the dollarization, which we try to quantify as individuals’ FX deposits as percentage point of M2 monetary base, and the core inflation, which just posted an all-time high in December (for the current series). Note that our VAR analysis suggests dollarization is the leading variable here. One other thing that should be highlighted would be the deposit rates offered by the banks have been on rising trend recently touching post-financial-crisis era highs as of the year end. This demonstrates the declining level in the efficiency of the monetary policy as the gap between market rates and the average cost of funding rate widens. This somehow could limit the dollarization to some extent, but Turkish central bank will eventually to need to keep real rates high to stabilize the local currency as well as the prices, and to regain its credibility. Sadly, this primarily requires to be given the green light by some authorities other than the policymakers at the central bank. Previous ArticleTurkey GDP Data: Time for an Overhaul?